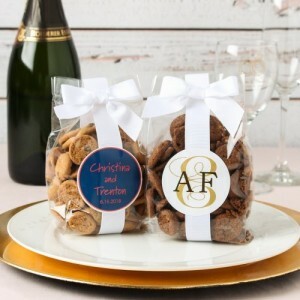 Which brings me to today’s super fun wedding favor – bags of cookies. Yep, we’re not talking just one or two pretty personalized cookies. No way. We are talking personalized bags of miniature cookies. These might be the BEST wedding favor…EVER. Imagine walking into a reception hall and seeing a little bag of mini cookies at every place setting. It’s a lot like what heaven might be like. Your guests will love these sweet treats – they’re perfect for the car ride home or for a late-night snack after the reception. 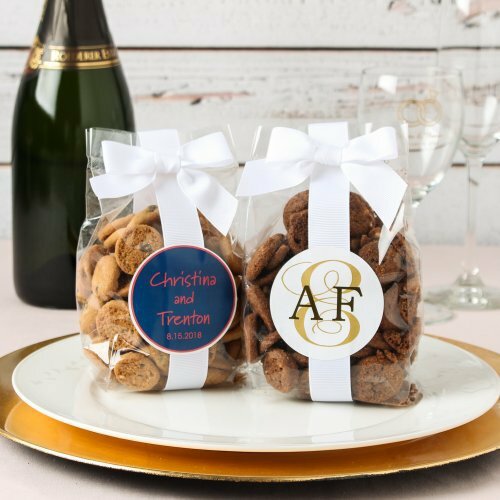 You can choose from several different personalized options for the bags and you can pick from four different cookie flavors. You’ll find these personalized bags of cookies here.